I recently wrote an article for Billboard about protest music in 2016 and beyond but I’d like to add a playlist and a couple of thoughts here. I hope we’ve seen the last of the “Where have all the protest songs gone?” thinkpieces for a while. It was a fair question five years ago but the length of this list alone shows how much has changed as the world has become harder and crueller. There are two major trends at work. One is the proliferation of songs about Trayvon Martin, Michael Brown, Eric Garner, Philando Castile, Sandra Bland and all the other African-Americans whose unjust deaths have fuelled the Black Lives Matter movement. These songs started arriving a couple of years ago but there are more than ever this year, from T.I. and Common to Kevin Morby and Drive-By Truckers. Black Lives Matter also provides the subtext for more personal and subtly political albums by the likes of Solange and Blood Orange. The other is Donald Trump, whose campaign an unforgettably blunt response from YG and dozens of contributions to the 30 Days, 50 Songs project. The two streams converged in the year’s two best politically minded albums, both of which gave me some comfort after the US election: We Got It From Here… Thank You 4 Your Service by A Tribe Called Quest and American Band by Drive-By Truckers. Here are 33 powerful recent protest songs, in no particular order. I’ve created a playlist featuring the 27 songs available on Spotify and chosen two clips of post-election performances which dealt with Trump’s election in very different ways. Plus, courtesy of Beyoncé, the year’s most memorable collision of pop and protest. I’m sure we’ll be seeing and hearing a lot more like this in 2017. 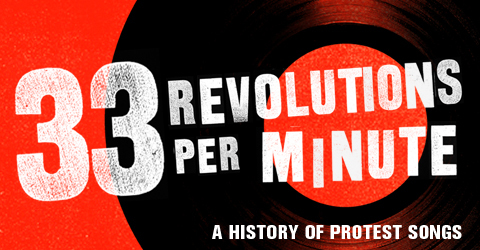 Where have all the protest songs gone? They’re all around us.